Clear dish with a lovely swirl pattern. Dish - Clear Swirl B&B Plate (20/rack) Clear dish with a lovely swirl pattern. B&B/Saucer (2.. 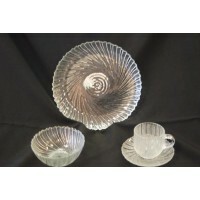 Dish - Clear Swirl Salad Plate 7.5" (20/rack) Clear dish with a lovely swirl pattern. B&B/Sa..